Oral care is something that you cannot compromise even a little if you want a healthy life. Brushing is the most important part when it comes to oral hygiene and care. While brushing is really enjoyable to some, it is really a critical and time consuming procedure for people who have opted for dental braces. But, to make things easier there are certain types of toothbrushes for braces. Which would ensure that you have minimal problems brushing and that- your teeth are cleaned effectively. What type of brush is suitable for braces? Well, there are lots of types of braces toothbrushes on the market. Speaking on a generalized manner, using brushes which have specialized bristles to reach into the cracks and crevices with better movement and flexibility are just about perfect brushes to be used while having braces. You could also opt for electric toothbrushes, but today our main focus is on the best manual toothbrush. Why is it important to own the best toothbrush for braces? At times it may hurt to brush over your braces and moreover the tiny cracks and crevices inside your braces may not be cleaned effectively which may give rise to risk of dental problems. 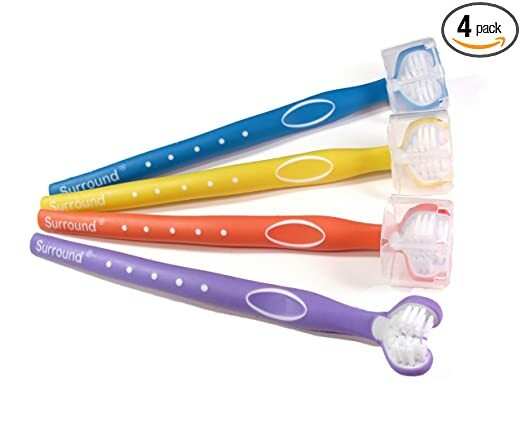 Since normal toothbrush are made for cleaning general surface of your teeth, these soft bristle toothbrush are made for reaching and cleaning the crevices of your braces where food particles may get stuck ensuring clean teeth. If you have braces, it is important to get a soft or medium toothbrush to save yourself from a lot of trouble – just like you with a waterflosser. Below mentioned are reviews of 5 of the best toothbrush for braces which are effective and has their own set of unique features. I’ve been using an O’nano toothbrush for several weeks and it’s by far the best. You can feel the bristles brushing away all the plaque in your mouth. Easy on the gums, but rough enough to still give it a good brush if you want it to. It is important to note that the O’Nano toothbrush we reviewed here is only suitable for adults. But O’Nano has been so generous to understand the needs of parent, they made a suitable version for kids. The long bristles easily fit under the wires of my braces. I feel like I don’t miss any spot with this tooth brush! The Easy braces toothbrush is designed cleverly. It has a combination of long and short bristles alternatively which is supposed to be doing a better cleaning on braced teeth. But the verdict is, for kids it may be good since kids have smaller teeth and hence smaller braces. The longer bristles will work greatly for them, but for adults opinion vary since in bigger teeth with bigger braces. The longer bristles seems to get stuck in the braces. So, it is not much effective in cases of bigger teeth. If you’re an adult with short and / or small teeth, you shouldn’t experience problems with this orthodontic toothbrush. Also, it comes with 6 differently colored brushes for the price of one. Something for the whole family! The multi-sided bristles means you get a great brush in little time. It’s very efficient. The surround toothbrush belongs to the race of more mechanically advanced best manual toothbrush and can be regarded as one of the best toothbrush for braces. This brush has 3 bristle pads at different angles which helps it glide on teeth making sure that it gives proper cleaning to every corner of your teeth. This especially has soft bristles and though made for adults and bigger kids, it also has a toddler version available. Having 3 bristle pads is immensely helpful for cleaning, even the gums do not get hurt. But when used on the inner side of teeth, the brush head being a little big may take a few practices to master. Overall, this brush is perfect for people wearing braces and also it makes cleaning easy and less time consuming. There’s 4 in the pack, but if you have a bigger family, you can grab the differently colored 8 pack! Some of the bristles are longer to reach that tricky space between teeth where the wires make it hard. In my opinion this is the best toothbrush out there. This brand of toothbrush sports ultra soft bristles. The bristles being narrow and tapered polyester, gives an overly “soft” experience to people who generally are used to harder bristle brushes. This brush works great for braces, since the bristle are super soft, they easily penetrate the wires of your braces. If you are experiencing gum problems such as bleeding gums or sore gums, the Perio Toothbrush is your best bet! The Perio brush may be the softest toothbrush on this list, it is also the most durable as some consumer mentioned using the pack of three for up to 2 years! The kids can now brush better around all of that (expensive!) dental work (braces) in their mouths. This vee-shaped toothbrush really helps get into the nooks and crannies around the brackets. This toothbrush for braces is made specifically for use with braces by Oral B. The bristles are moderately soft and not for people with gum problems. This Oral B toothbrush for braces has a V cut in the middle which helps avoid the edges of your braces. The handle is long and thin but strong with a thumb grip. It cleans your teeth easily but you may have to spend a little bit of time making sure that each of the wires and brace pieces are cleaned. It is a good purchase for those who really love brushing as it makes cleaning braces much easier than using normal toothbrushes. There are six of them in the pack with varying color. Great for familys! With so many choices out there, the above few are some of the best toothbrush for braces available. Everybody having different dental conditions, it is hard to select something in a generalized manner. 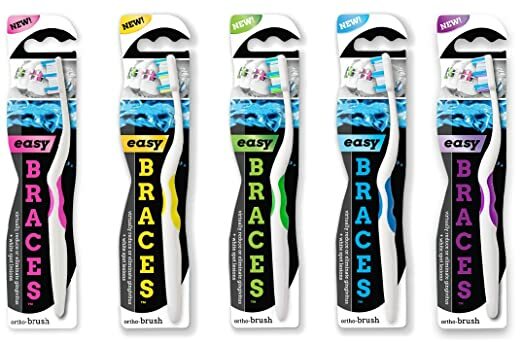 The braces toothbrush reviews stated above will help you in selecting the brush that best fits your dental requirement. Since your teeth may get sensitive, we also recommend the best toothpaste for sensitive teeth.